ch1, * 1hdc in next ch, sl st in next ch * rpt from * to * to end, sl st in sl st on beginning of row. Turn. sl st in last hdc, sl st to top of ch2 on beginning of row. Turn. * to * to last sl st, work 1hdc in sl st, sl st to sl st on beginning of row. Turn. Rpt Pattern Rows 1 & 2 seven more times until 15 rows have been worked in all or work measures approx 3.5 Inches. Fasten off. Finishing - Sew and tie off loose ends of yarn. Wear long or wrapped twice around neck. Add decorative buttons if you wish. 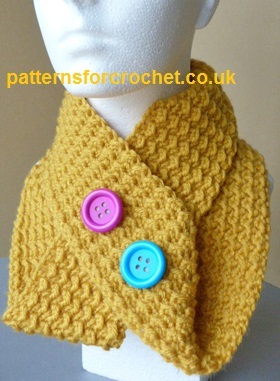 Hope you enjoy this free crochet pattern for an easy cowl.